The rehabilitation of this site consisted of installation of livestock exclusion fencing and joint vegetative plantings. Plantings consisted of various local, native shrubs. 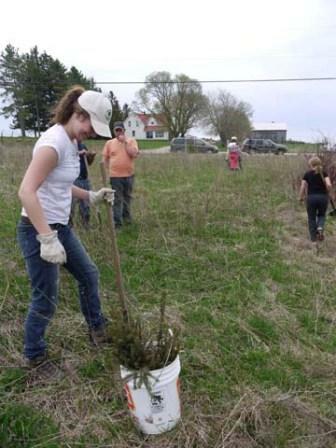 The landowner along with Manitoulin Streams and local volunteers planted trees and fenced off the main channel of Grimesthorpe Creek along with part of a seasonal tributary and low lying marsh area from cattle access. The trees will contribute to the already existing, but limited variety of vegetation and will create a canopy area that will shade the creek and provide proper habitat and food sources for invertebrates. Prior to fencing off the area it was accessed by livestock for the purpose of gaining access to drinking water which allowed for large amounts of sediment to be dislodged and transported downstream, covering valuable rainbow trout and brook trout spawning areas as well as suffocating eggs and invertebrate populations. This not only affected aquatic species, but affected the biodiversity of the area, specifically the low lying marshy area, which is home to a variety of terrestrial species such as birds, frogs and turtles. The landowner was also encouraged by Manitoulin Streams to apply for Environmental Farm Plan funding to fence off and rehabilitate this low lying section and main channel area, as well as fence off the seasonal tributary that feeds into Grimesthorpe Creek. Finally, the stewardship work done in that area has contributed to the success of recruiting other landowners along that creek to consider restoration efforts on their properties in future years. 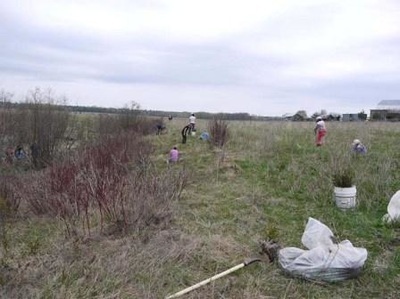 The rehabilitation of the Grimesthorpe Creek 2011 site involved fencing and tree/shrub planting in a 12138 sq metre area of shoreline & wetland protected, stabilized improved and/or retired from agricultural use. Total trees and shrubs planted was 500. (400 bare root trees, 100 bare root shrubs). 221 metres of electric fencing installed to restrict livestock. Digging of holes and installation of 18 posts for the fencing. Enrollment in and access to funds in the Environmental Farm Plan by the landowner. This project had 7 volunteers from the Board of Directors of Manitoulin Streams participate in planning and actively volunteering at rehabilitation sites. The total number of hours volunteered for this site is 51.4 hours. A total of 36 other volunteers contributed 105 hours mainly by tree planting and conducting field work The landowner and family (2) contributed 56 hrs of labour and 6 hours of attending meetings. Equipment usage was the use of tractors and materials off the property. Funding contributions toward the construction of the project include CFWIP, NOHFC and the Environmental Farm Plan.